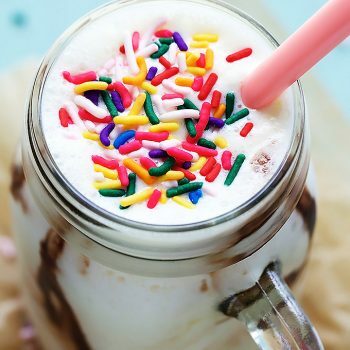 This creamy Cake Batter Smoothie you can whip up in minutes! 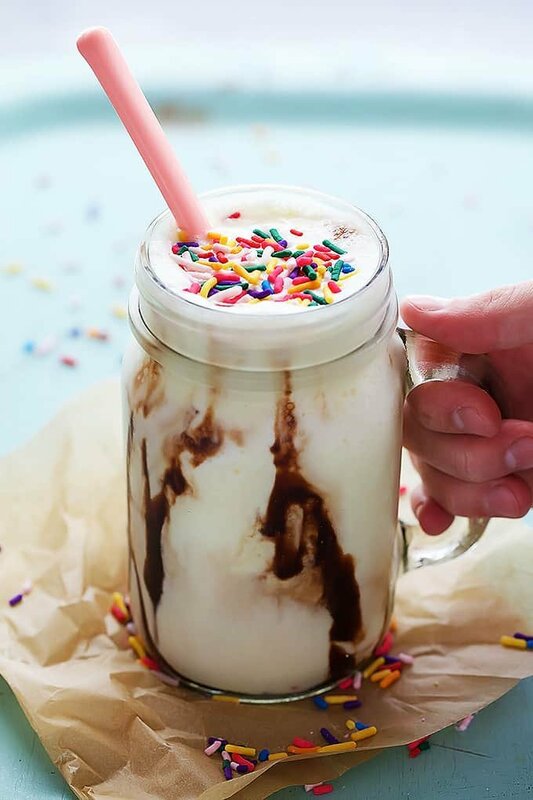 Top it with chocolate syrup and sprinkles for the ultimate summertime treat! Can we continue on the smoothie theme today? Would that be okay? Oh, you totally love smoothies and never get sick of them especially when they involve sprinkles?? Good, me too. I think I’m experiencing a bit of that forbidden fruit syndrome right now because I’ve been craving cake batter like there’s no tomorrow even though I’m pregnant and technically can’t have even a lick of raw cake batter due to the raw egg situation. Similar to when someone says “whatever you do, don’t look at…” – I’m totally going to look. Or try this one, don’t think about flamingos. Now you’re thinking about flamingos. So I’m craving cake batter something fierce and when I get a craving, it must be fulfilled. Sooooo a cake batter smoothie it is. Cake batter? yes. Raw eggs? not a single one. And depending on how healthy or not healthy you want to make this here perfect summer treat, you can choose to use yogurt (regular or Greek – yeeah protein!) or straight up vanilla ice cream (for those days that call for the hard stuff – I totally get it). Bottom line: 4 ingredients and 2 minutes in the blender is all you need to get your creamy frozen cake batter fix, folks. It’s pretty spectacular. 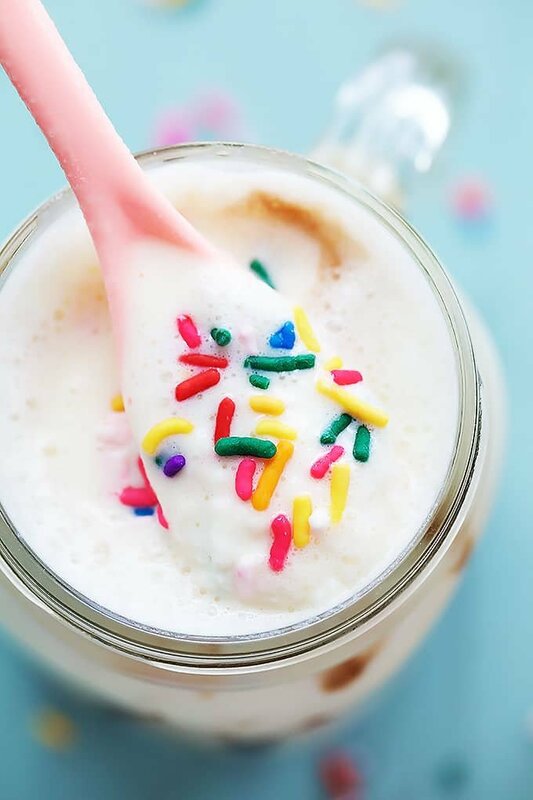 Creamy cake batter smoothies you can whip up in minutes! 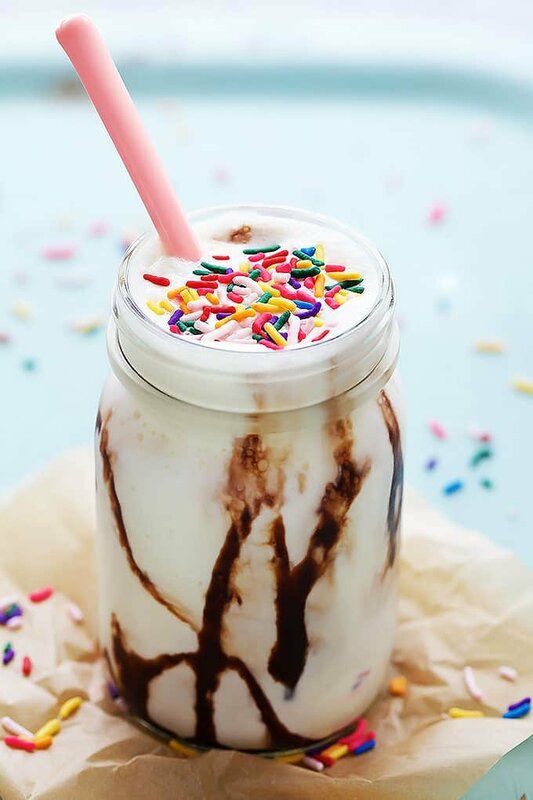 Top it with chocolate syrup and sprinkles for the ultimate summertime treat! Add ice, yogurt (or ice cream) cake mix, and milk to a blender or food processor. Pulse until smooth (until you don't hear the ice crushing anymore). Check consistency, if too thick add a few tablespoons of milk and pulse to desired consistency. 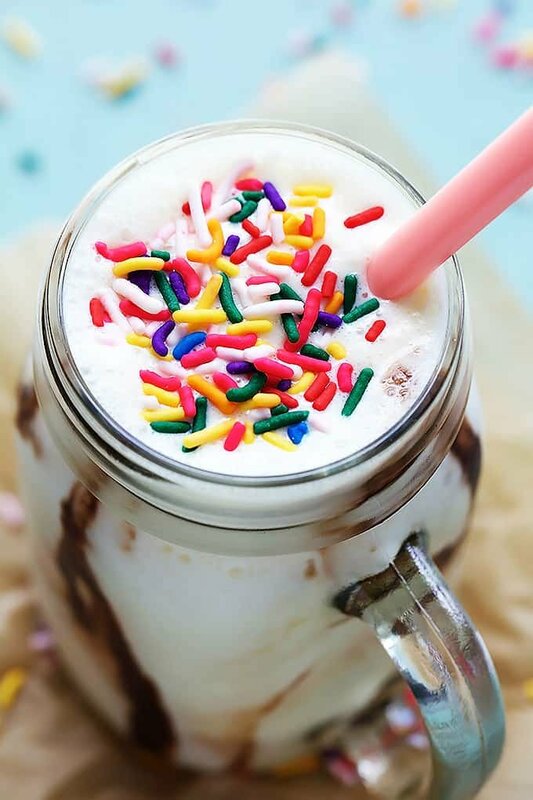 Serve immediately with chocolate syrup and sprinkles if desired. I never ever get sick of smoothies! Especially ones that are four ingredients! Perfection! Can you use chocolate cake batter instead? Mm, delicious! I just made this. I had just run out of yogurt, so I made some DIY yogurt-ohsheglows.com has an excellent recipe, if you’re curious-and whipped it up in my blender. It wast overly sweet, which is perfect. The portion size was definitely a bit too much for me to finish, so next time I might half the recipe. Great recipe! It tastes (and smells) just like cake batter! This is a big check in my book.